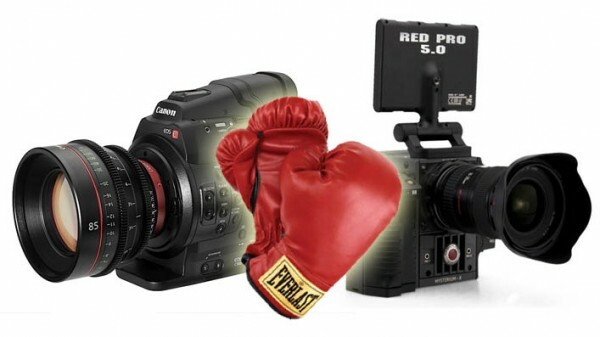 NextWaveDV – How do RED and Canon’s new cameras affect the average shooter? Two major camera announcements from two major camera manufacturers were made today, but what does that mean to me, the average shooter? Quite a bit actually. First off is the direction that high end productions are taking. No longer is a small sensor an acceptable form of acquisition. Now we see that all major manufacturers have put their hats into the large sensor camera arena. Sure there is still a place for small sensor cameras, news gathering for one, but the world is forever changed by large sensor cinema. That said, these two cameras come in at $10K and $20K respectively which is out of the budget for the average shooter. Most of us will be sticking with our video DSLRs or considering a Panasonic AF100 or Sony FS100. This is a good decision process and something that you will no longer have to go through while having the nagging question in the back of your mind: “But what if Canon or RED release a cheaper camera with better specs…?” I don’t see that happening any time soon. RED has chosen to make $10K their lowest price point and has abandoned their old “3K for $3K” slogan they had with the first announcement of the Scarlet. Canon on the other hand has made the most expensive camera they have ever produced, specing it for film, television and high end video productions. “Where is their low cost competitor to the AF100 or FS100?” Well, you probably already own it. The video DSLR looks to be something they aren’t stepping away from, especially with their sneak peek at a 4K video version. So did RED win? Well not exactly. The Scarlet X is a great looking camera and is speced very well for its price point. However, RED is known for the additional cost of operation. Media storage, accessories and potential hardware and software issues can add to the cost of it and bring it right along side Canon’s C300. Plus, there are people who will benefit more from a simpler workflow from the Canon camera versus the RAW workflow of the Scarlet. For myself, the FS100 stands ahead of the rest…at least right now. The cost/performance ratio makes it the best option for me. I don’t do heavy visual effects, I don’t need cinema PL mount lenses, I don’t have a budget over $10K for a camera and I don’t want giant files to work with. I like the image from the FS100 and can now purchase it with confidence not worrying about what else might come out in the future. Regardless of your budget to own, these are both great options to rent if your production demands it. Plus they are much more affordable (including rental rates) than say a RED Epic or Arri Alexa. The best part about all of this is that there is still a camera for everyone. Whether you have $800 or $80,000, you can take the story you have and bring it to life. Last word: Forget about the camera! Focus on improving your skills rather than buying better gear. Whether it be writing, directing, lighting, shooting, editing, etc. they all are vitally more important than the camera you own. Reminder: if you’re interested in pursuing video production for profit, check out our new training series, Video Business 101: How to Make Money in Video Production. Well said, Tony! 🙂 Thanks for your input on this!